Our Research and Development is based on market needs of Health industry professionals in the U.S., Australia and India and is designed to form the basis of a Clinical Risk Management Program based on variances of clinical data readings, abnormalities in Color Doppler, X- Rays, MRI, CT-Scans or Retina Scan images and Laboratory Results. To date our proprietary technology has been integrated with the following devices to manage Chronic Disease. Current developments also include applications to incorporate devices to monitor Sleep Apnea and Stroke and a specific process to manage Mental Health. The technology includes features to incorporate clinical data thresholds for each patient based on their age and clinical profile. The Daily dashboard which highlights variances from these thresholds is furnished to the Primary Practice Physician as the first stage of a clinical risk management process. 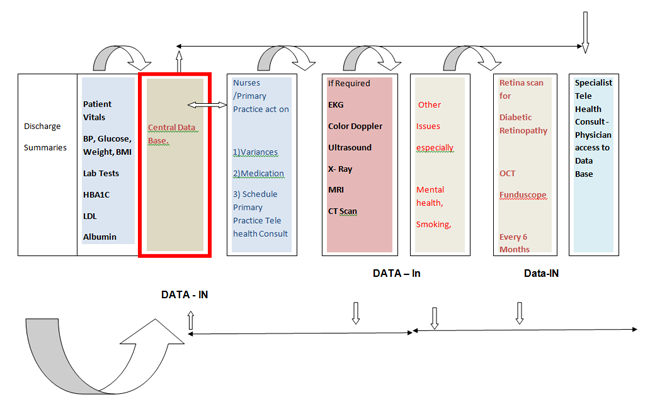 The figure below provides a sample of the Integrated Patient Clinical repository which can be accessed by Physicians, Nurses and Members of the Multidisciplinary Team from any location to manage risk and communicate with the patient. The Clinical Outcomes below relate to a Diabetes Program for a 3,000 Patient population developed by our Director Mr Giridharan Vaidyanathan.